Durham County established a Department of Social Services in 1919. 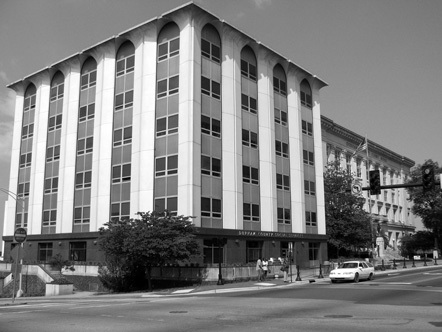 The department moved to the building pictured here in downtown’s Government Services District in 1966, where it was constructed on the site of Durham’s first YMCA. Guided by its mission to “partner with families and communities in achieving well-being through prosperity, permanence, safety and support,” the department today supports a variety of programs such as job search assistance, Medicaid, food stamps, daycare assistance, child support, and child protective services. In the near future the new Durham County Human Services Complex will house the Department of Social Services, along with the departments of Public Health and Mental Health. All clients will benefit from upgraded facilities, and the many clients who receive services from multiple agencies will benefit from the consolidation of services into one complex.